The Australian Library and Information Association (ALIA) has announced a new campaign that will promote the library profession throughout 2019. 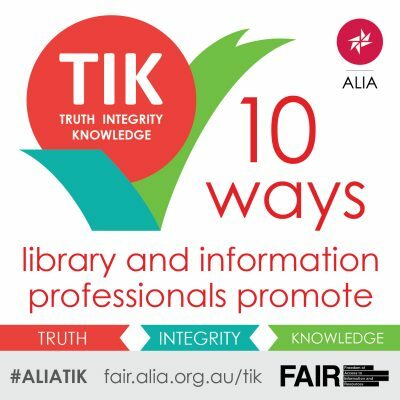 The Truth, Integrity, Knowledge (TIK) campaign will focus on ‘why librarianship is one of the most trusted professions in Australia and how people working in libraries promote the free flow of information and ideas in the interests of all Australians’. According to the announcement, the campaign ‘will remind people that, in a society driven by fake news and the 24-hour media cycle, they can rely on libraries for quality information’. Throughout the year, guest bloggers from the library and information profession will write articles for ALIA’s Freedom of Access to Information and Resources (FAIR) website to highlight the campaign’s theme of ‘10 ways that library and information professionals promote truth, integrity and knowledge’. TIK-themed member functions will also be held in each state and territory. For more information about the TIK campaign, visit the FAIR website.